Toy Nippon: BBTS News: New Funko, DC Collectibles, Diamond Select, Starcraft, Terminator, Transformers & More! 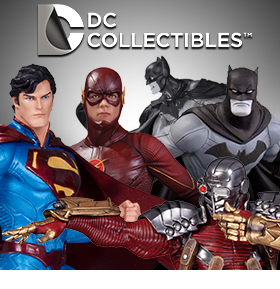 BBTS News: New Funko, DC Collectibles, Diamond Select, Starcraft, Terminator, Transformers & More! 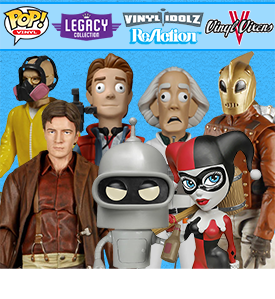 We have listed an incredibly huge amount of new items from Funko that includes a couple of new lines and a bunch of new properties. Check out the new 8” Vinyl Idolz stylized line and Shogun Boba Fett! Legacy Collection Fans can now get their hands on the crew of the Serenity. Find a huge lineup of ReAction Retro figures and new others in the Pop! lineup. We have 9 new listings from a variety of anime lines such as Ultraman, The Irregular at Magic High School, Infinite Stratos, Sengoku Basara and more. Your collection will score a bull’s-eye with this incredible bust of the world’s deadliest assassin. Bring the hit CW show The Flash to life and into your collection with this amazing statue that captures the likeness of The Flash. This statue stands approximately 12.5” tall. Acclaimed artist Cully Hamner brings his inimitable style to the Man of Steel with this newest entry in the line of statues featuring unique designs from all eras. This limited edition statue stands approximately 7” tall. From Superman: The Animated Series comes this 9” tall PVC statue of his cousin Supergirl. She rests atop a rocky outcropping and comes packed in a full-color window box. Supergirl is in scale with the other Femme Fatales PVC Statues. With so many characters and looks to choose from, DST is offering a second, completely different assortment of figures based on Avengers: Age of Ultron! 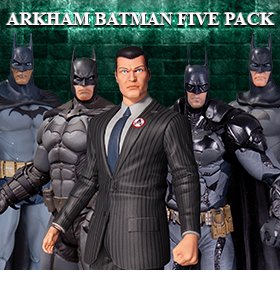 With three different two-packs, plus a rare, one-per-case variant two-pack, this top secret line-up features 14 points of articulation and interchangeable parts and accessories for each figure. The Universal Monsters are back with an all-new Legacy Series Box Set! This black and white set brings together Quasimodo, a Mole Person, and a transforming figure of Dr. Jekyll and Mr. Hyde. 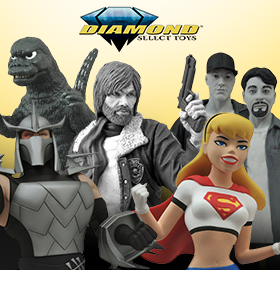 The figures look like they just stepped off of the silver screen! Each 7” figure features 16 points of articulation and a small diorama base. The fifth series of 5” action figures debuts 5 new celebrities: Stan Lee, Lenny Kravitz, Matt Groening, Adam West, and Tom Petty! Also included are Bart Simpson, Homer as Lenny Kravitz, and Milhouse as Fallout Boy. You can get these in a case of 22 for $269.99 or a set of 8 for $109.99. We also have the five celebrities listed individually for $14.99 each. Nemesis Prime is the third release in the transformers D-Style model kit line. He comes with his blaster, battle axe, Matrix, and even a mini version in truck mode. This Superman boasts his classic costume, a real cloth cape, and an alternate arm part to recreate the classic ‘power action’ move. To commemorate the 40th Anniversary of the original Texas Chainsaw Massacre, NECA created the definitive collector’s version of Leatherface as he appeared in the 1974 film. Loaded with accessories, cool features, detail, and articulation, he is packaged in a Deluxe 40th Anniversary window box. These insanely detailed iPhone 6 cases will definitely be the topic of conversation when you have an incoming call! Choose from the 1989 Batmobile with light-up headlights and taillights, a jet engine that projects the bat signal, and sliding fenders that allow access to the camera, flash, and side controls; or the BTTF II Delorean Time Machine with flip out front tires for camera and side control access, and light up headlights and “wiring”. These nearly 12” tall ball-point pens feature Mario and Luigi and come with a block base for display. When you pull the clip down, the figurine on top disappears into the warp tube, only to reappear at the bottom along with the pen’s tip. We have these in a set of 2 for $33.99 or we have Mario for $15.99. These 12” collectible figures are clones from designer Ashley Wood’s Popbot world. Each figure comes with a sword. We have Saisho (pink), Saigo (White), and Itsumo (orange) in a set of 3 for $329.99 and individually for $119.99 each. These 12” figures are part of designer Ashley Wood’s Popbot world. Sensai KoGeki (red) comes with 2 scythes and 4 grenades and Dai Ni Sutoraiki (yellow) comes with 16 grenades and 2 swords. We have the set of 2 for $219.99 and Sensai KoGeki (red) for $119.99. This figure changes from robot to rescue helicopter and also becomes a limb for Prometheus. Summanus brings some much needed power to this team. He changes from robot to a fierce Stegosaurus and is named after the Roman god of nighttime lightning, as his mighty stomps are sure to emulate. The first three figures of the Avengers team have arrived in their Pop! versions. Find Hawkeye, Captain America and Hulk in stock now. This 7.5” tall statue is based on the art of Eduardo Risso. This version of Nightwing is the next figure in the DC Collectibles lineup of figures based on DC Comics - The New 52 story arc. Now you too can create new adventures for the legendary Cthulhu with this new line of 3.75” retro style action figures by Warpo. The set of 4 is priced at $79.99 and includes Spawn of Cthulhu, Cultist, Professor, and Deep One. We also have Spawn of Cthulhu individually for $19.99. Amp up your X-Men adventures with a blast from the past with this all new X-Men Set! This box set includes Marvel’s Cyclops, Marvel’s Angel, Marvel Girl, Iceman and Marvel’s Beast. Each figure stands ready to defend the X-Men and the human race from certain disaster! Continuing the ever popular Mogwai series, this assortment contains concept Mogwais created by Rick Baker Studios for Gremlins 2: The New Batch. Patches, Zoe, and Gary each feature multiple points of articulation as well as NECA’s signature poseable rolling eyeball mechanism. You can get these little cuties in a set of 3 for $39.99 or find Patches and Gary individually for $13.99 each. Re-create your favorite scenes from the cult classic Pulp Fiction film with this new assortment of 3.76” ReAction Retro Action Figures. We have Vincent, Jules, Mia, Jimmie, Butch, The Wolf, Marsellus, and The Gimp in stock. Japan’s favorite fluffy monster is now impersonating Slimer, The Staypuft Marshmallow Man, and a Ghostbuster in Funko’s super-popular POP! lineup. 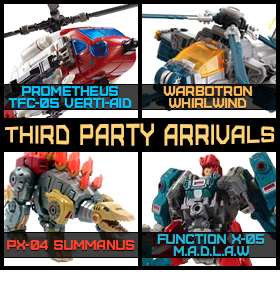 We have a bunch of new upgrade sets for enhancing your transforming robot figures like the DW-P23 New Partners Head Set for $19.99, and the DW-M03 Swords in Red and Silver for $14.99 each. This fantastic new set can be put in robot mode or trailer mode, and can also be merged with a certain leader of the good guys to give him fancy wings as well as longer legs. This add-on set also includes a chest armor plate and added firepower; and can be merged with the Masterarmor suit to make yet another powered-up combination of the heroic warrior. The swift and sneaky servant to Skeletor arrives masked with an alternate unmasked ponytail head, alternate belt, nunchucks, samurai sword, bow, and quiver of arrows. Snake Armor He-Man comes with brand new armor, sword, and an arm attachment for wrangling snakes. Battle Armor King Hssss is ready to strike back with his snake staff and shield. The plush Alpacas dressed as characters from Tiger & Bunny are back again! For fans of cuteness and fans of the hit show, the 12" Cosplay Alpacas are the best of both worlds. We have Barnaby Brooks Jr Hero Suit, Wild Tiger Hero Suit, Blue Rose Hero Suit, Kotetsu Kaburagi, and Barnaby Brooks Jr. Choose your favorite or collect them all!